This book is set in Romania, including Hoia Baciu, the world’s most haunted forest (yep, I went there). So I’ve considered Castle of Ghosts and Forest of Ghosts. Even Village of Ghosts, but nothing is grabbing me. If you’re up for the challenge, leave your title idea in the comments. The winner will receive a free ebook of their choice and a mention in the book’s acknowledgements. If you already have all of my books, I love you, and I’ll make sure you get an advance copy of this latest GhostWriters installment, hot off the press. 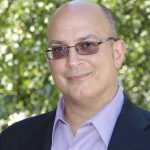 Back to our regularly scheduled programming…a guest post from award-winning author J.G. Faherty. Bitter winds blow as you stagger down the street, the last of your holiday gifts clenched to your chest. Once again, you’ve waited until the last minute and now it’s almost midnight as you fight ice and snow for the three long blocks to where your car is parked. The roads are empty, all sane people already home and tucked into bed or asleep in front of their TVs. A distant rumbling that rapidly grows louder. You’re confused at first – is there a train somewhere close by? Or a truck approaching? No headlights illuminate the street. The ground begins to vibrate beneath you and suddenly you recognize the sound: hoofbeats. The thunder of many horses running at full speed. Two blocks away, a massive fog bank appears, the mists shifting and roiling. And then they appear! Dozens of gigantic horses, each with a fur-clad warrior in the saddle. They swing massive swords and axes over their heads and their manic howls fill the night. Great hounds, black as the sky and larger than bears, lope alongside their equine companions. For a moment you are frozen by the sight, and then instinct takes over and you run, run as fast as you can, run for your very life. But it’s too late! The savages overtake you and a heavy blow knocks you to the ground. You roll over and find yourself face to face with a giant, an ogre clad in hides, with a thick, unkempt beard down to his belly and a helmet bearing the antlers of an elk perched on his head. Fiery eyes glare at you and when he speaks his teeth are crooked and yellow, his voice the bellow of a prehistoric beast. “Ho! More meat for the larder!” Your mind tries to grasp what’s happening, but before you can blink strong arms lift you up. The last thing you see is a heavy club swinging at your face…. Sound like the beginning of a horror movie? It could be, but it might also be the fate that awaits you if you’re caught outside of your house after midnight during the thirteen days before Christmas. Because that’s when the Wild Hunt roams the Earth. At least according to Germanic and Norse mythology. Led by The Winter King, the Wild Hunt is when the denizens of Winterwood, a land of perpetual ice and snow that exists in an alternate dimension, can enter our world and hunt for human prey. Depending on who tells the tale and where it originates, the folk of Winterwood could be ogres, trolls, ghosts, or elves. And their leader goes by many names as well: Wodan, Odin, The Yule King, and Fionn mac Cumhaill. The Winter King rules the universe from fall to spring, when he is replaced by the Wood King, the bringer of life. The Winter King is also the basis for the demon we know as Krampus. In the oldest of tales, the Winter King has thirteen sons, the Yule Lads, and his wife is a witch: the Crone, also known as Percha or Gryla. The Yule Lads have a different job than their father, although the end result is the same. They go from house to house and try to lure children outside, where they kidnap them and bring them back to their castle so Gryla can bake them into pies for the big solstice celebration. And they don’t roam the Earth alone – there’s also the Yule Cat, the Jolakotturinn, a beast larger than a car who roams the streets in search of children who haven’t received gifts of sweaters under the Yule tree because they’ve been bad during the year. The Yule Cat peeks into windows and if there are no presents… watch out! Meeeowww, you’re nothing but a tasty morsel to him. Does all of this sound familiar? Ring any Christmas bells? What happened was, over time, the different but similar myths of the various northern European countries got blended together. Suddenly Krampus and the Yule King were one and the same, and instead of a Wild Hunt, Krampus just roamed the Earth with his lads, looking for bad children that he stuffed into a sack and brought home to eat. Fast forward a few centuries, and the leaders of Christianity decided that pagan gods and demons shouldn’t be worshipped, but they knew you can’t just go in and tell people to stop. So they did the next best thing–they integrated the old tales with their own myth of Saint Nicholas, the patron saint of children (and also students, pawnbrokers, sailors, merchants, and brewers), who had a reputation for going through towns and leaving secret presents for people to celebrate the birth of Christ. This tradition became known as Sinterklaas in the Netherlands. So you had Saint Nick delivering presents to the good children, and Krampus stealing away with the bad children. But that was still too dark and gloomy for people, and over time Krampus became a mischievous imp who left coal in the stockings of bad kids. And the legend of Sinterklaas morphed into Santa Claus. As time went by, Santa grew more popular and Krampus got forgotten, at least by commercial media. Nowadays, Krampus is enjoying a bit of a resurgence. 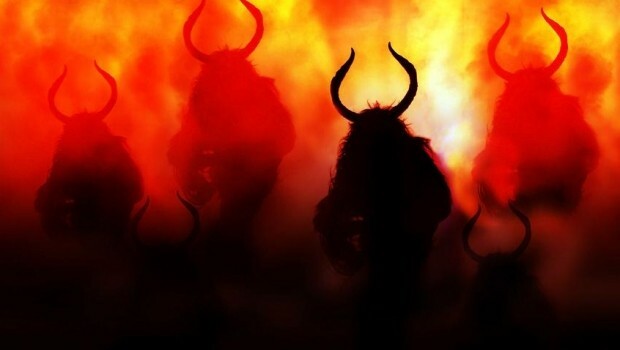 There are Krampus celebrations throughout Europe, and even the U.S. is getting into the act, with many cities having Krampus-themed events. Much like Halloween, commercialism has stolen the frightening aspects away from this devilish figure and turned him into a caricature. Yet some folk still take care during the days before Christmas to return home before it gets too late, and to make sure everyone has a gift – preferable a sweater! – under the tree. Because you can never be too sure. After all, every tale has an origin in truth. 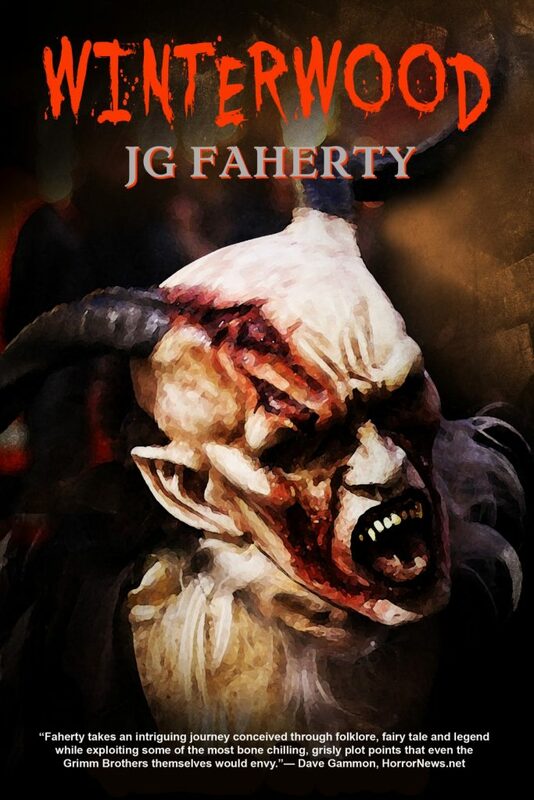 A life-long resident of New York’s haunted Hudson Valley, JG Faherty has been a finalist for both the Bram Stoker Award® (The Cure, Ghosts of Coronado Bay) and ITW Thriller Award (The Burning Time), and he is the author of five novels, nine novellas, and more than sixty short stories. He writes adult and YA horror, science fiction, paranormal romance, and urban fantasy. His short story, “The Yule Cat” (in 12 Scares for Christmas), and his novella, Winterwood, both deal with the Wild Hunt and the dark side of Christmas. Follow him on Twitter, Facebook, www.jgfaherty.com, and his blog. I act7ally have a devil head on my Christmas tree and I love it. It is based on an old glass mold, apparently, and the legend stems from the medieval times. I heard Krampus was more known in Southern Germany and, as one ventures to other parts of Germany, one gets different tales. My mom grew up in Wittenberg and St. Nicholas always was partnered with an angel. I do love how these legends come into being and I am happy to say I always found chocolate in my shoe on December 6th. My parents always had a potato in their shoe…again from my mom’s area where she was born. Interesting how the different cultures intertwine. I’m of Scandinavian decent. I think we can learn more about ourselves from the lore of our home countries. I love the Krampus legend and I really liked learning a bit more about his origins here. Hope you have a fab new year! I suppose for the sake of my children, I prefer the way things have changed. Still, it’s fun (and terrifying) to see where it all started. Fascinating! I didn’t know about Krampus and I’m a little nervous as I didn’t get a sweater for Christmas. Love the idea of a Yule Cat though. The Ghost/s of Seasons Past? Thank you for this lovely and terrifying tale. Good to know origins – which weave their way into the present! I can vouch for Winterwood–it’s amazing! Reading it has become an annual Christmas tradition for me now. Because somewhere in the forest is a glade. The old stories of the Wild Hunt always brings me back to Terry Pratchett’s THE HOGFATHER, one of my favourite Christmas books and movies. I should break that out this weekend. I don’t know if that was any help, but Happiest of Holidays to you! I think I read that story of J.G. Faherty’s! I loved it. I like hearing all the origins of various holidays and how they turn into a mixture of many different cultures. I’m so excited for the next GhostWriters book!! As for name ideas… hmmm…. Village of Moroi … and Ghosts! Loved the recounting of tales from dark days long ago! Fascinating! Hmm…I’m taken by the ill-making qualities of the forest. Something like… Infected by the Forest of Ghosts..? Tricky! I’m glad you bring up Sinterklaas as nobody in the US has heard of him or this tradition. On December 6th, as long as I lived in Belgium, Sinterklaas visited the homes of children with his “black helpers” (yeah…) and left presents. He still does. Children put carrots or sugar cubes in their shoe in front of the chimney for the horses. And the black helpers would put bad children in their sacks when they were empty of presents. As far as titles go… Medley of Ghosts, Hamlet of Ghosts, Clearing of Ghosts, Spot of Ghosts? Loved reading and learning about Greek and Egyptian myths when I was younger. My knowledge of the Norse myths wasn’t as great. But reading this makes me interested to learn more from other parts in the world. Never heard about Krampus before until they made a horror movie about it. Thanks Lidy! Those are great title suggestions. I love older stories and legends. Thanks for sharing this! You’re very welcome, Gina. Thanks for stopping by!